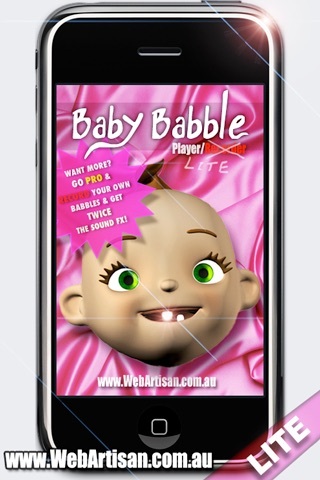 ► FREE: Get your baby fix with the ever so cute "Baby Babble" player. 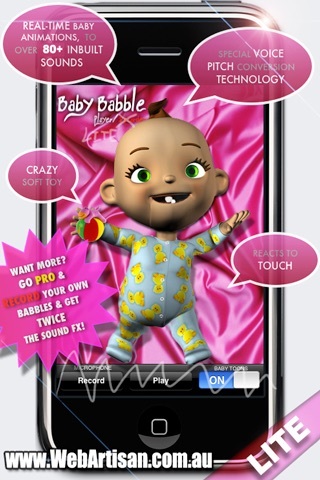 Interact & play with baby and watch & listen to him babble to over 80+ sounds, in the cutest real-time animation. ► Go PRO & audio RECORD your own Babbles, plus access all 160+ sounds! Touch his face, hands, feet, face & tummy to see & hear how he reacts in different ways. Press the toy in his hand & watch him go crazy over the many fun sounds it makes. Using special voice pitch technology, see baby sweet pea’s mouth, eyes, face & tiny arms & feet move in sync with whatever he babbles. 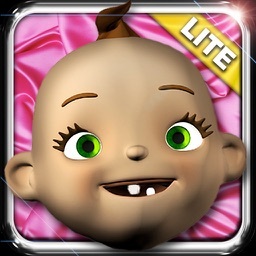 There’s also an optional "Baby Toons’ track to add to the fun. You & your kids will be kept smiling, by just how cute he can be. How about RECORDING* the audio of your own baby’s babbling? Go PRO and you can! With "Baby Babble" inbuilt record* feature, iPhone owners have the extra ability to audio record whatever you want for baby to say back! "I love to play :)"
Please note*: The iPhone has a built in microphone as standard, whereas the iPod Touch does not. The iPod Touch therefore requires a 3rd party microphone accessory in order to use the "Baby Babble" record functionality. Record functionality is only available in the PRO version. A microphone is not required for all other features of "Baby Babble". 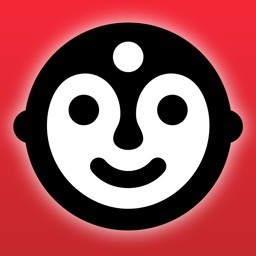 From the makers of Galactic FX, Amazing X-Ray FX², Food Additives & KungFu FX.